The Weather Pro jacket is made of 18-ounce ripstop fabric laminated with Polartec’s Power Shield fleece, making this breathable jacket fit like everyday clothing. 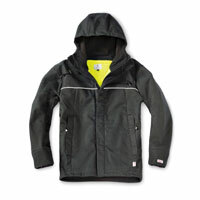 It wicks moisture away, keeping users warm and dry, and features fully sealed seams to lock out water. The jacket offers reflective piping across the chest and back, as well as a fluorescent yellow mesh lining.